Perception sometimes equals reality when it comes to marketing. Businesses that win and are successful often create a public persona and brand that enables them to remain at the top of the food chain through emotional and clever marketing. It is not about the facts but how they touch the hearts and emotions of their customers and fans. Prestige brands sell products for premium prices that don’t reflect the real cost of production but how their products make their clients feel. They tap into the limbic and emotional part of the brain and bypass the thinking cerebal cortex. How else can you justify the purchase of a coat, dress or shoes that sell for $2,000 when the cost of making it is $30? Does the price for an Apple iPhone or a Loius Vuitton bag reflect real or emotional value? The booming sales for premium brands reveals that “Human beings are in fact rationalizing creatures and not rational creatures“. Does High Facebook Competency = Innovative Brand? A recent study by L2, (a think tank for digital innovation) of prestige brands on Facebook involving 350 data points poses this thesis. “Competence on Facebook is linked to shareholder growth and is a proxy for innovation within an organization“. They have attempted to quantify the Facebook competence of 100 iconic brands across Beauty, Fashion, Specialty Retail, and Watches & Jewelry. They then used took the loading and metrics from that methodology and categorized each brand with a label starting from “Feeble” through to “Genius”. Here are the premium brands that achieved the highest ranking according to L2’s research and placed them at the “Genius” level. These Facebook pages activities, tabs and integration are worth emulating. When it comes to “Fashionistas” they want to know what’s in and what’s out. 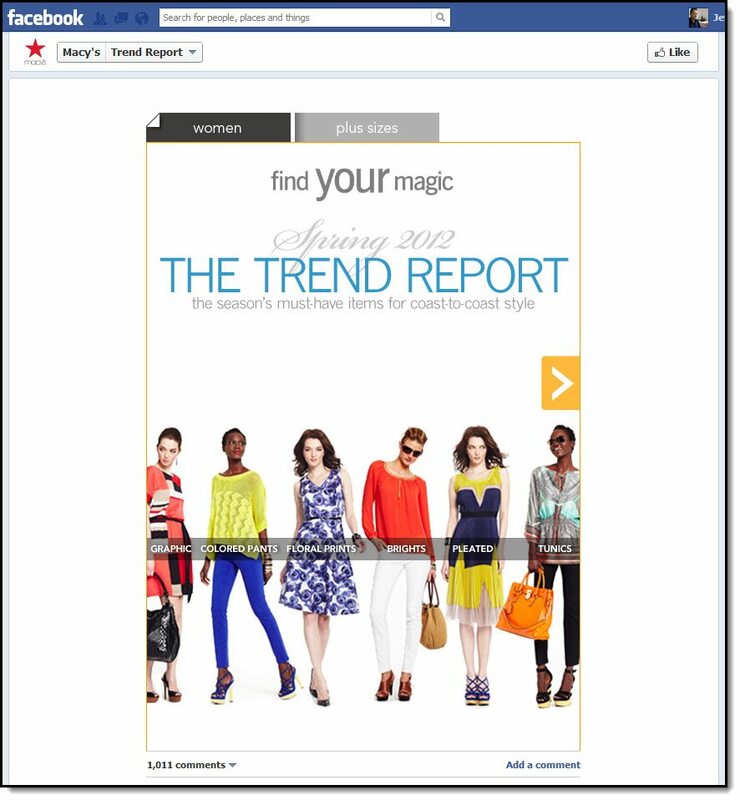 Macy makes it easy with a trend report that is a Facebook app that is highlighted as a tab, that shows the latest women’s fashion trends in a highly visual format and includes the latest trends of graphic prints, colored pants and floral prints. How could you apply this concept and strategy to your business? 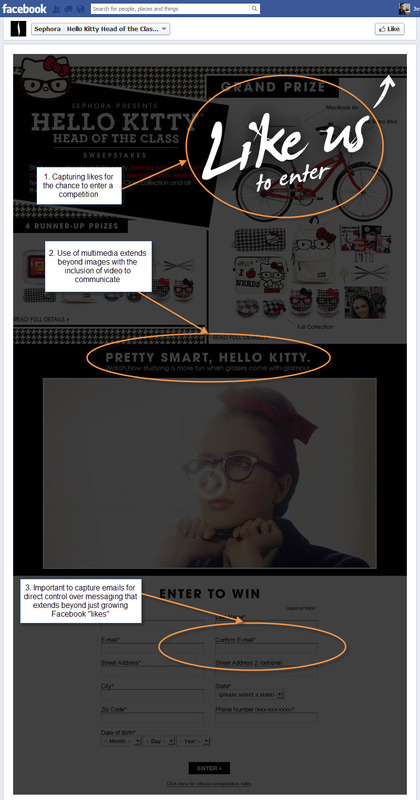 Contests and sweepstakes work well on Facebook. Research showing that over 50% of customers “like” a page to receive discounts coupons or a chance to win. Sephora has a well optimized app for its Sweepstakes which includes capturing “likes” to enter, communicating with video and also building its email subscriber database for control over its online direct messaging that doesn’t rely on just capturing likes. Are you using Facebook to build your email subscriber database? Lancôme Paris is a luxury beauty brand, which offers high quality skin care, make-up and fragrances to suit every womans individual needs. Founded in 1935 by Armand Petitjean in France, Lancôme celebrated its 75th anniversary in 2010. Petitjean’s motive was simple: to create a beauty brand that would deliver French elegance around the world. Fans of brands always enjoy being taken behind the scenes. 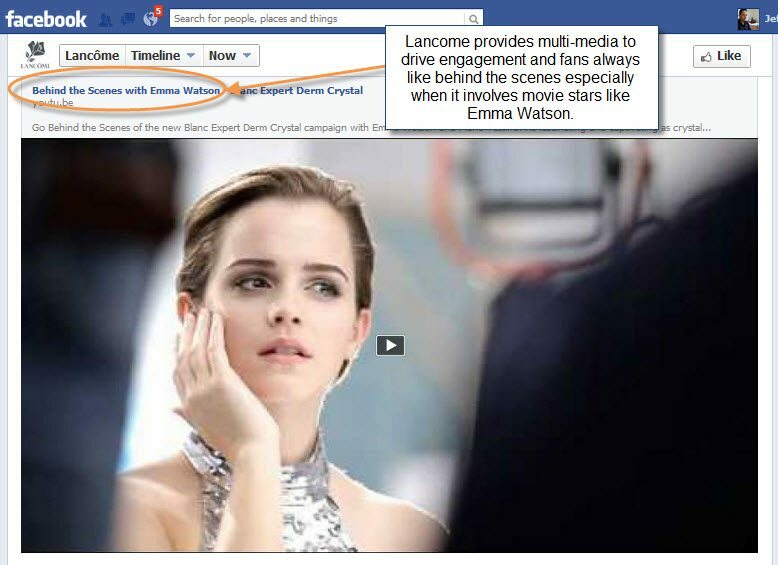 It humanizes Lancome and enhances engagement on what is still a social network. Also linking another premium personal brand of Emma Watson adds a halo effect that provides that star quality. Providing online video that transports the viewer to another world that is not often seen or experienced also provides media that some people prefer over images or text. Communicate with as many media types as time, money and resources allow. Also notice that the video image is large and in high definition, which by its nature is compelling. Michael Kors is a world-renowned, award-winning American fashion designer of luxury accessories and sportswear for women and men. The brand was launched 31 years ago in 1981. Social media is about content which includes images, articles and videos. 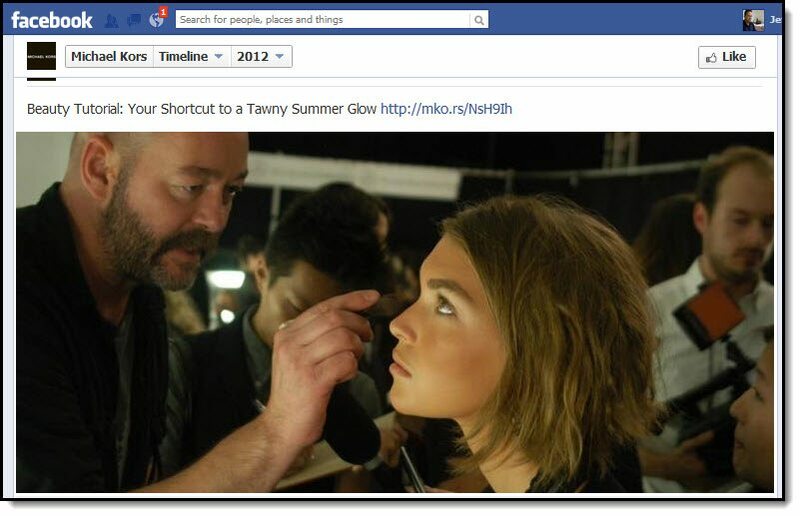 Adding value through content includes “How To’s” and here Michael Kors’s Facebook page provides a tutorial on makeup. 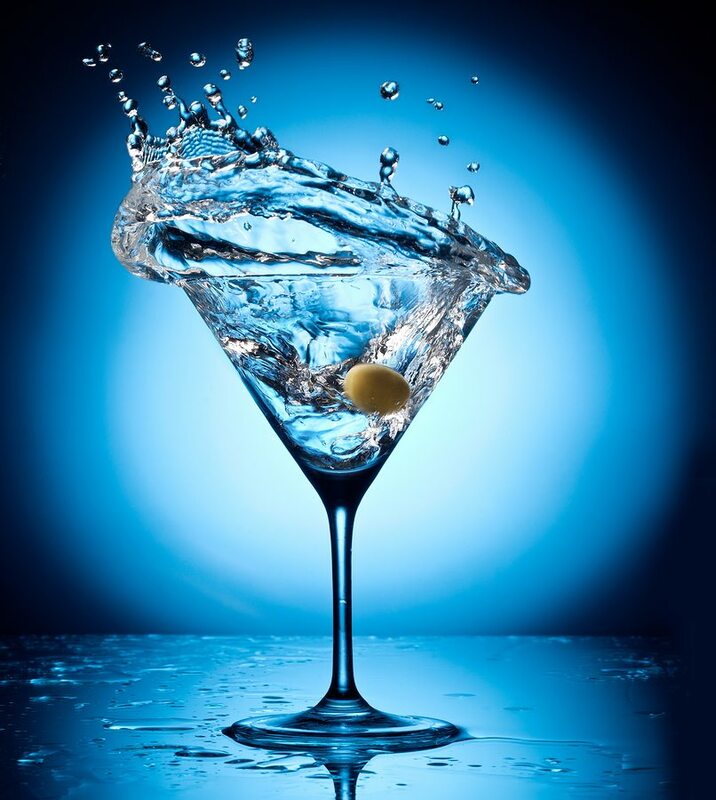 B2C Facebook marketing is not just about entertaining, offering discount vouchers or competitions. How are you adding value to your customers lives on Facebook? Are you entertaining or educating? 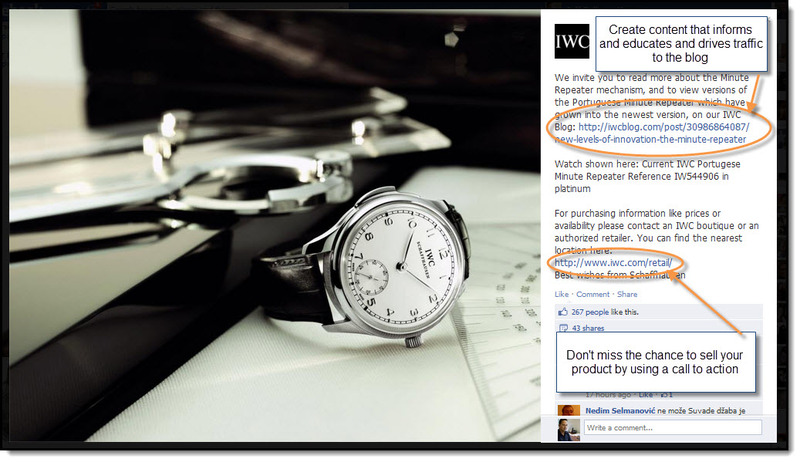 IWC understand the use of high definition images to connect to the emotional limbic brain. They also don’t forget to provide information for the cerebral amongst us who need the facts and figures to justify the emotional decision. They also use quality images in large format that showcases the preium quality of their product . Are you using high quality images on your Facebook page? Do you include a link to your online store? What is interesting is that this list is very different to last years when they first released the premium brands research for Facebook. Not one of last years top 10 is on this current list. Is there anything new that these 5 top Facebook pages have revealed to you. Which one did you like best.